Today, I started my baking for Operation Baking Gals. I have made three different cookies, so far. I am hoping to bake another tonight and a few tomorrow so I can ship them out, at the beginning of the period of time. I usually get there on the last day. One time when I baked for the soldiers, I used Taste of Home since they have easy and durable cookies. Other times, it was a random decision. This time, I am baking Martha Stewart recipes. The two I made, so far, were good. One, I loved and the other was OK. These chewy molasses cookies were fabulous. Baked correctly, the outer rim is a little crisp and the inside is chewy, a delight to the tongue. Today is an exciting day, in our house, because, I finally bought gluten-free oats. 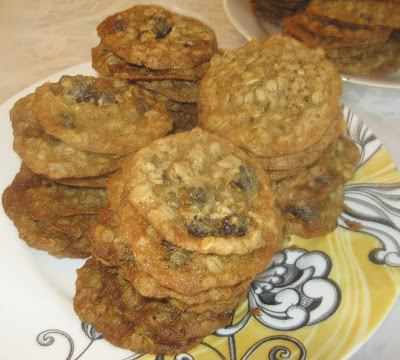 For 18 years, I have baked a few items with oat meal (GF) but I never had the oats for crumbles and cookies and all that good stuff. Today, I received a shipment of the real thing, rolled oats. I baked cookies and my daughter is excited to make an apple crumble and we have so many plans. This is truly like a new toy, for us. The problem is that I was not sure what the cookie should be like. Should it be thick. Does it spread (oh yes!) Will it taste good? ....another resounding YES!!! It is time to explain what I envision for Bake with Bizzy. I love desserts and I am happy to have the opportunity to add so many, from all of you, to my baking list. I would love to see more bread and what about a new take on baked potatoes? What do you bake besides dessert. Feel free to link both your sweet and your savory. The only qualifier is that it is baked. I am baking for the soldiers again so you should be seeing some new cookies. I limit myself in what I bake since these are traveling far from my home. With the heat and possibly rough treatment, I want to give those cookies, the best shot. It is exciting to send to those who fight for our country and it is even nicer to do it the right way.